The start of this year was a little difficult for me; January and February were tough months that were both a bit of a blur of feeling down and low. Stepping into Spring I'm feeling much better though, and am able to look back to the low place where I was and just take valuable lessons from it. When I was feeling low, my gorgeous friend Merlina made me a 'Happy Box' to cheer me up, and I just had to share it with you because it's the best idea ever if you want to cheer someone up. This is the loveliest and most personal gift I have ever received - it left me with tears in my eyes and feeling a lot more happier. If you know someone who is feeling down or low and you want to cheer them up, I think this is a great idea (and the opportunity to get a little creative woohoo!). 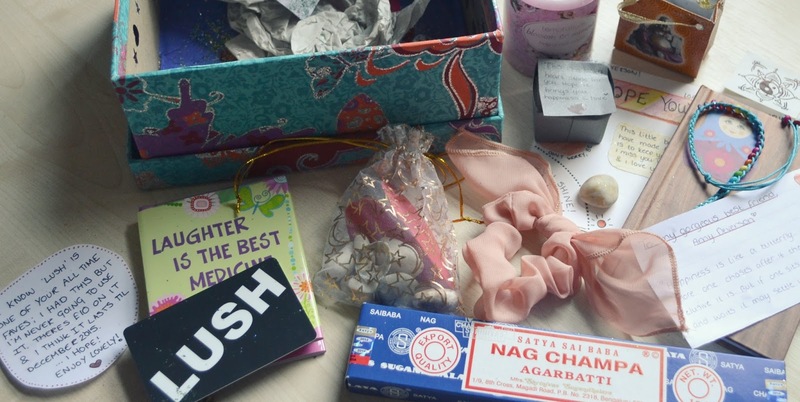 I wanted to share what was in my Happy Box to give you inspiration to make some yourselves - for a family member or friend who's struggling, or maybe just for yourself to open when you're feeling down. My Happy Box was a gorgeous patterned box filled with glitter and gifts. I couldn't believe how many things were in there, but each individual item is super personal and lovely, particularly the homemade bits! The first thing in my box was a blossom and mimosa candle. If you know me, you'll know that I'm obsessed with candles so obviously this is the perfect gift for me. The second thing was a pack of scrunchies (one's in my hair right now so I couldn't photograph it - sorry!) which is a lovely idea if you're buying for a girl as trust me, you can never have enough scrunchies. The next thing in my box was a gorgeous little book called 'Laughter is The Best Medicine'. It's filled with little quotes of happiness and loveliness that are designed to cheer you up when feeling down. 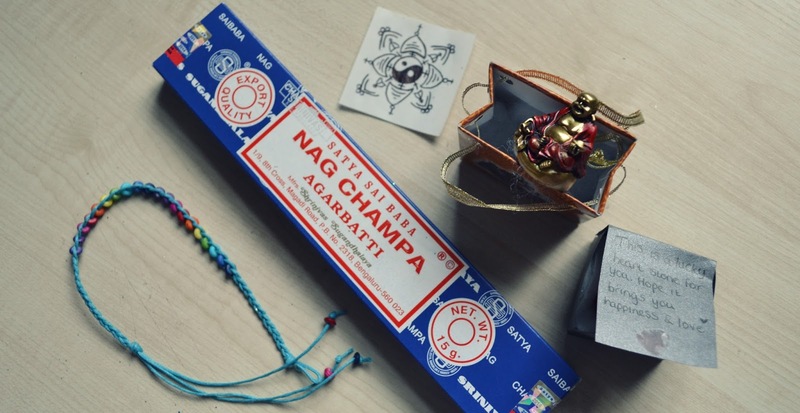 Next, there was a gorgeous little bead bracelet and a pack of my favourite incense sticks (Nag Champa). Burning incense sticks is always calming and relaxing so I thought this was a super cute idea for a Happy Box. I also received a mini buddha (to rub his tummy for good luck!) and a little box which contained a red heart. On the front was written 'This is a lucky heart stone for you. Hope it brings you happiness & love' - so lovely. 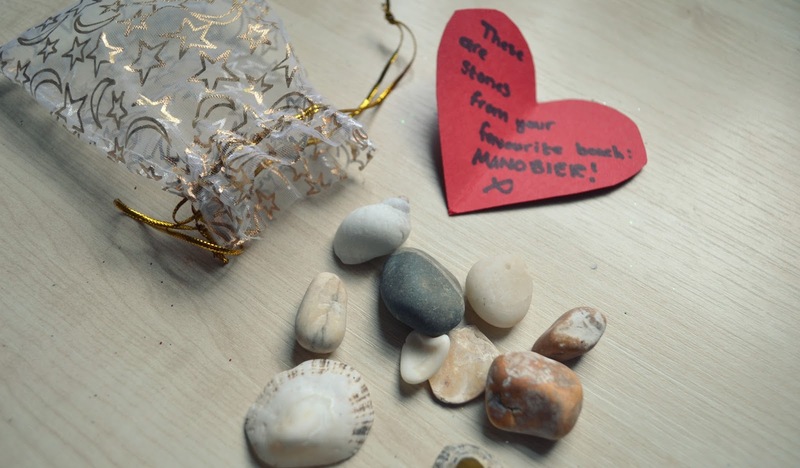 My friend also included a little bag of rocks and shells with a note that said 'These are stones from your favourite beach!' Being away at uni in Bristol means I miss the beaches from home so much, so now I can have a bit of it with me wherever I go! 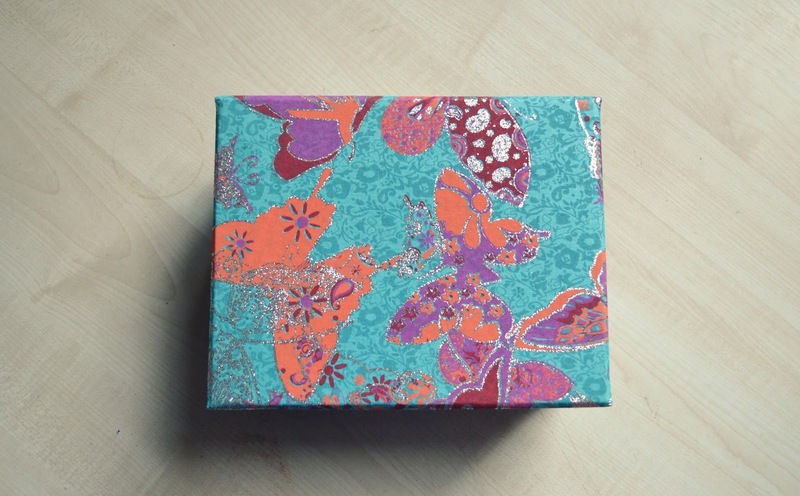 I think this is one of my most favourite ideas about the box - so simple but so effective and meaningful. 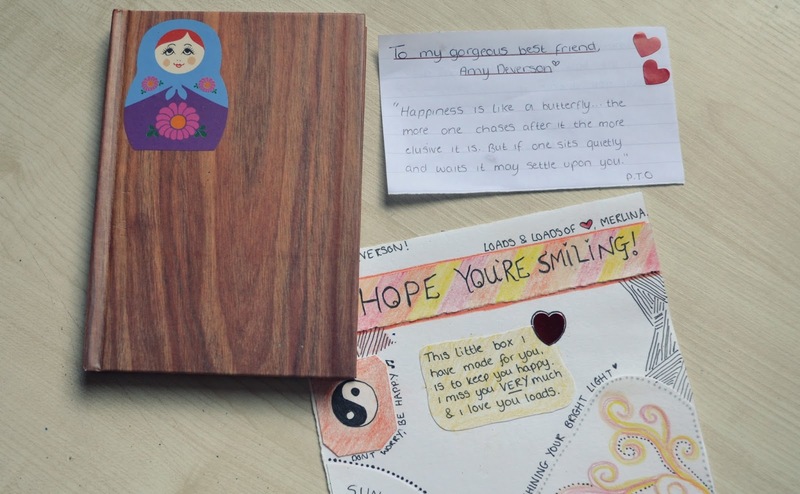 A lovely wooden notepad was also included, with the instructions to write down happy thoughts and poems. I've decided I'm going to keep this in my bag and take it with me wherever I go, to always note down my happy thoughts and experiences. Nothing beats a homemade little card, and the one my lovely friend made for me was gorgeous. Adding homemade little cards and quotes is a lovely touch and means so much more. Finally, Merlina included a card with the quote 'Happiness is like a butterfly.. the more one chases after it, the more elusive it is. But if one sits quietly and waits it may settle upon you.' I love this quote which is why it was included - finding a quote that is meaningful to either yourself or your friend is a lovely personal touch and something they can read when feeling down. I'm so lucky to have such a thoughtful friend and just couldn't resist sharing this! If you know someone who is feeling down, make them a Happy Box and make their day. 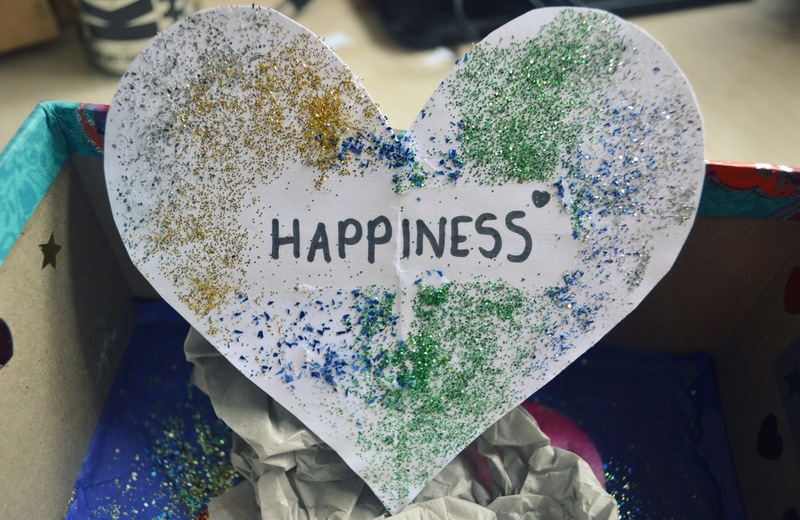 If you're feeling down yourself, make your own one - fill it with things that make you happy and are meaningful to you, and open it when you're down. 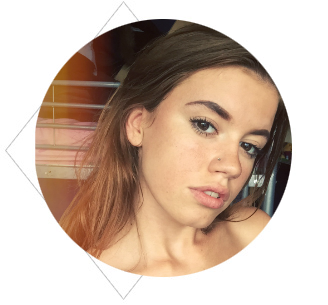 I hope this post has been somewhat inspiring! What a fabulous present - and a very thoughtful and special friend. I must keep the 'happy box' in mind. It's a great way to cheer someone up! I know, it's such a lovely idea and gift! It cheered me up a lot. this is SO lovely! And such a great idea. Your friend obviously knows you inside out and that so nice she put this together for you. Spring always cheers me up too, I'm so happy to see some sunshine! Wow! This almost made me a little emotional. So lovely of your friend to do that for you :) Lush definitely makes everything better. What an amazing idea! This box really reflects on the strength of your friendship! :) I love the additional handmade notes as well, makes this gift box even more special. What an awesome gift! I bet you were so excited to receive this! Everything is so thoughtful! Love this idea, Might even give it a go myself. This is a lovely idea!! Absolutely love it.